District heating currently provides approximately 1-2% of the UK’s heat demand. Research shows that there is a possibility that district heating could supply in the region of 14% of the UK’s heat demand, and be an extremely feasible and cheap alternative to both individual fossil fuel and renewable technologies, at the same time as reducing bills for the consumers involved. Community and district heating pipe networks are not specific to the technology used to generate the heat and so can connect to a range of sources of heat supply including CHP, biomass, energy from waste, ground source heat pumps, geothermal heat or large power stations. This means that because district heating pipes have a longer life than generating plant, networks can be put in place now based on whichever heat supply technology is most appropriate or economic at the time. 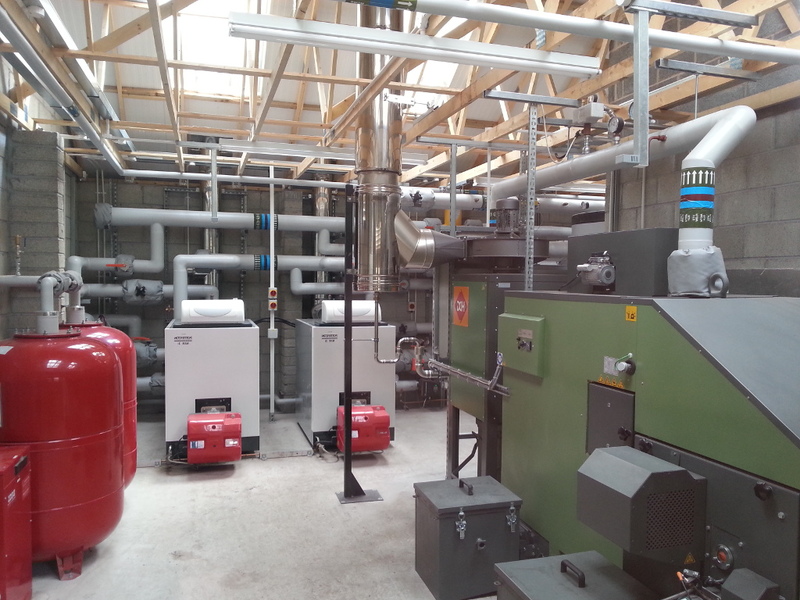 For large sites such as schools, hospitals, businesses and estates, especially in rural areas, district and community biomass heating systems are an ideal way to shatter existing fossil fuel heating costs and turn what is a an increasingly debilitating overhead into a healthy and stress-free profit, using the governments new Renewable Heat Incentive (RHI) scheme. Large scale biomass heating systems producing around 450,000 kWh of heat per year, can cut heating costs by 50% over oil (24,000ltrs) and reduce CO2 emissions by 95,000kg per year. The systems are often housed in their own buildings or in special boiler rooms, with the hot water piped underground, via insulated pipes to the buildings that require heat. 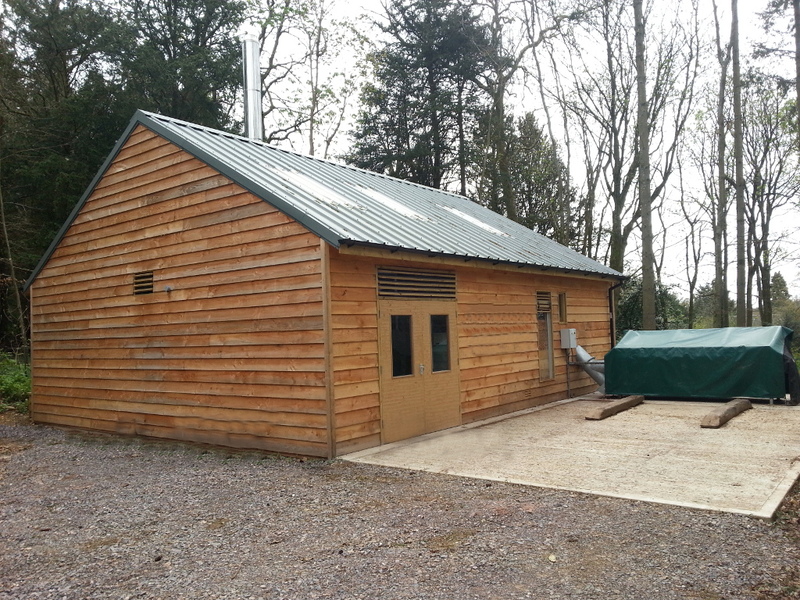 The entire community biomass system consists of a fuel store, biomass boiler, backup fossil fuel boilers, large accumulator tanks, expansion vessels, a whole lot of plumbing and a control centre. Trees are felled and stored allowing water to evaporate, a chipper is then used to turn the logs into woodchips. Regular deliveries will be made by a local supplier who tips the woodchips into a ‘hopper’ from where it is moved into the fuel store with an auger screw feeder mechanism. NB. Wood pellets can be used as well. On the floor of the fuel store is a rotating pair of arms which move the woodchip into another auger and into the boiler. Specialist controls, monitor how much heat is needed in the houses/properties and control the amount of fuel added to the boiler. The boiler operates at around 650°C. As the woodchips or pellets enter the remaining moisture is evaporated, toxic gasses are burnt off and the energy within the wood is turned to heat. A heat exchanger within the boiler, transfers the heat energy to the water in the heating system. Intelligent combustion controls ensure that an efficiency level of 93% is maintained. Hot water at 90°C is stored in large insulated tanks called Accumulator tanks, where it is then pumped around the underground highly insulated pipe network delivering 85°C hot water to each of the buildings on the site. Oil or Gas boilers are connected to the system to provide both a backup and a boost heat source if required and ensure the biomass boiler operates at maximum efficiency all year round. A Building Management Systems measures heat in the boilers, accumulators and buildings and automatically controls the use of the boilers to maximise efficiency. 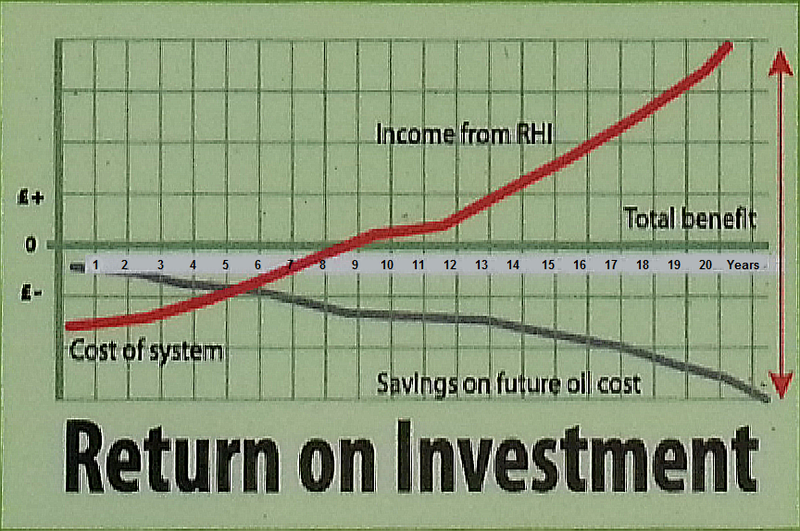 The return on investment / payback period of a typical* community biomass heating system is likely to be in the region of 5-6 years and for such a large initial expense, that is an unbelievable return on investment. If you think your business, community or facility could benefit from such a system contact us or one of our biomass boiler installers for further information on how to progress the idea. *example size figures used above as each will be sized and operate differently at this scale.